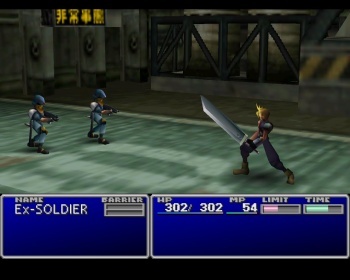 Square's original plan for Final Fantasy VII was to keep things largely similar to the series' 2D entries. An interview with Final Fantasy VII director Yoshinori Kitase published in the latest issue of Famitsu magazine (via 1up) reveals how the game came to be what it was at release in 1997. Though it may seem like Square knew exactly how to bring the series to the next level, Final Fantasy VII's development was filled with a lot of uncertainty. Kitase says that Square knew something "new" was coming to videogames, and it likely involved 3D, but 3D hadn't cemented its presence yet when development began on Final Fantasy VII. Square had been monkeying around with tech demos of 3D CGI, but hadn't considered using it for the entirety of the game. "At the time, we figured that the only place in the game we'd actually use 3D was in the battle scenes," Kitase said. "The first bunch of PlayStation RPGs used Super NES-style world maps, with 2D sprites placed right in the middle of the screen. I thought that would become the basic sort of standard for RPGs in the future. I definitely didn't think the field view would wind up in 3D, too." After working with the PlayStation hardware, Kitase says he realized that a change was necessary. "I felt that for this next generation, the field map needed depth and a character-oriented viewpoint or else we'd be losing out on story drama," he added. Before this realization, there was a heavy debate about the game's eventual format, an abnormality when developers would usually debate what kinds of new gameplay systems should be implemented. According to Kitase, a major developmental hurdle was that there were no previous games to "rely on." Things that we take for granted today, like a game that goes seamlessly from the play screen to a CG movie, had to be figured out from scratch. Memory was also an issue, as Square had no idea how many polygons it could use for Final Fantasy VII's characters and monsters. In the end, Kitase believes that the PlayStation is what allowed Final Fantasy VII to exist. He says that the console allowed him to "show people that Final Fantasy VII was an adventure played up close and within the world itself, not seen from overhead." As one of the most popular RPGs of all time, Square's hard work definitely paid off.